What they left out was that she looks like June Cleaver. Unfortunately, nowadays, it is most often used in a derogatory manner and preceded by the words "Little Miss". For example, "who does she think she is bringing that 12-layer mocha latte strawberry cake to Bunco? Little Miss Suzy Homemaker?" See, derogatory, not complimentary. 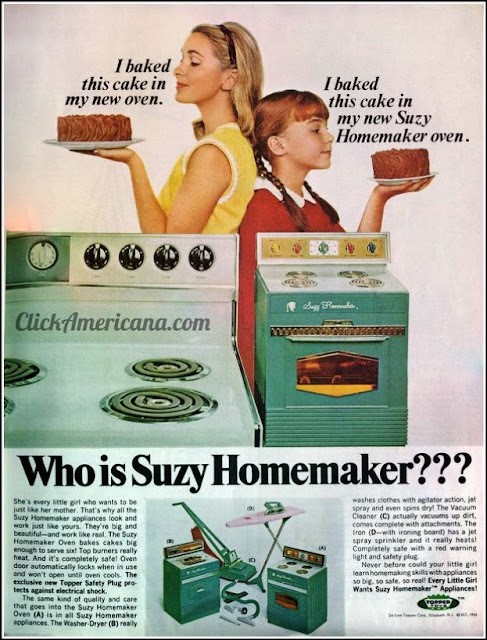 Since I recently heard this term, I decided to do some research as to who Suzy Homemaker actually was. I really don't know whether to be repulsed or tickled at the wording "a busy little mother's work". But, the bigger question is, do I really want a 5 year-old ironing my silk blouse? Or using the blender to make margaritas at my girlfriend party? 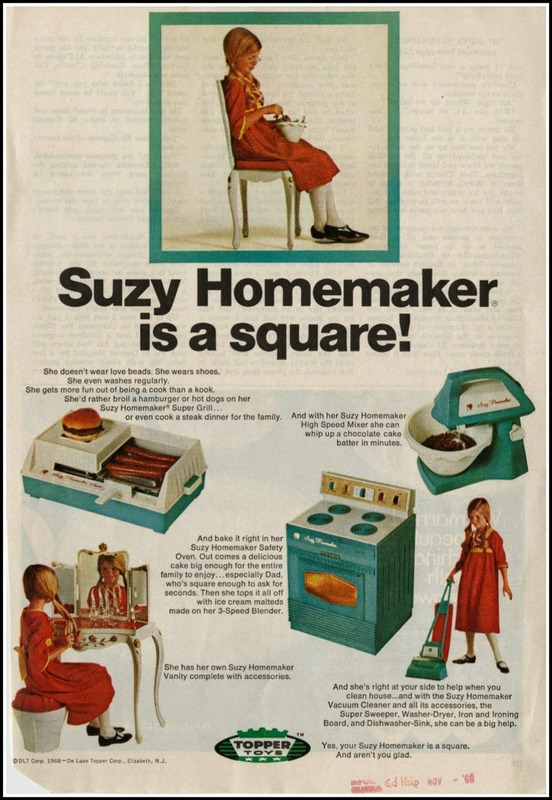 And the Suzy Homemaker Doll was second only to Barbie in doll sales. I figure her knees were jointed so she could get on the floor with those little girls who had to be on their hands and knees all day scrubbing the wax off floors. As I stated above, I've always heard the term but never knew it referred to toys. As a child, I never had the opportunity to own any of these toys. Maybe we were too poor for my parents to buy any of these for me (one of the ads encourages you to "charge it") or maybe my parents decided that if I was too lazy to do my chores, I was definitely too lazy to play with a toy that resembled work. Or maybe my parents exercised really good judgment by not putting an oven in the hands of a 7 year-old. They waited until I was 12 (way more responsible) and bought me a new Easy Bake Oven, Suzy Homemaker's largest competitor! I remember the Easy Bake Oven-they still make them I am pretty sure! LMAO….a radical feminist at 13???!! OMGosh, I can’t stop laughing. Did your brother like the Easy Bake Oven? Nancy Drew was pretty awesome! How did you girls fare with your mysteries? They were a little before me as well and I never knew they existed. I’ve always heard the term though and never thought of it being said in a bad way until about 10 years ago. I think of Suzy Homemaker as a good thing…you know, like Martha Stewart! ;-) LOL That doll is the worst!!! LOL Hugs!!! 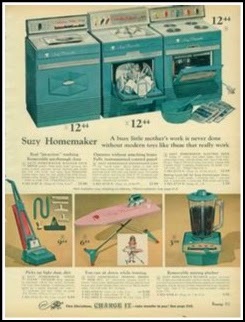 I never knew there had been a line of products until I wrote this post, but I’ve always heard the term Suzy Homemaker. I was the Easy Bake oven kid also. My youngest son wanted one when he was growing up, but I knew he would burn the house down, so we opted for a cardboard box for him…LOL He liked playing with the boxes more than the toys…LOL. Thank you so much for commenting! Have a great day! Hugs!!! You had me smiling all the way through...love learning the real facts behind "Suzy Homemaker"! Thank you Mary Alice! It was all new to me and interesting how sales drove trends even back then! Have a great evening! This one about the origin of Suzy Homemaker, etc. was really interesting. Who knew? I always thought it was just a phrase, a label attached to particularly domestic females. And all that was not of great interest to me. The cooking part was certainly not of interest; eating yes, cooking no. Baking held my attention more as long as it was simple and there were quick results....again....eating.... Having cupcakes, cookies and pound cake, gingerbread, etc. with my Dad. That was fun. It took a good many years before I would broaden my culinary horizons. Thanks for making this fun and interesting. Joan, it was definitely interesting. Cupcakes, cookies, pound cake, etc...all still my favorites. Hey, I wonder if can blame that on the Easy Bake Oven? They only had sweets to bake, nothing nutritious was offered...LOL Have a great day! Before my time, but now a days I'm glad there is a push to still teach kids, both girls and boys, how to cook and make things at home. Healthy habits start early (even if you make brownies)! I totally agree! Thanks so much and have a great evening! Me and you both! 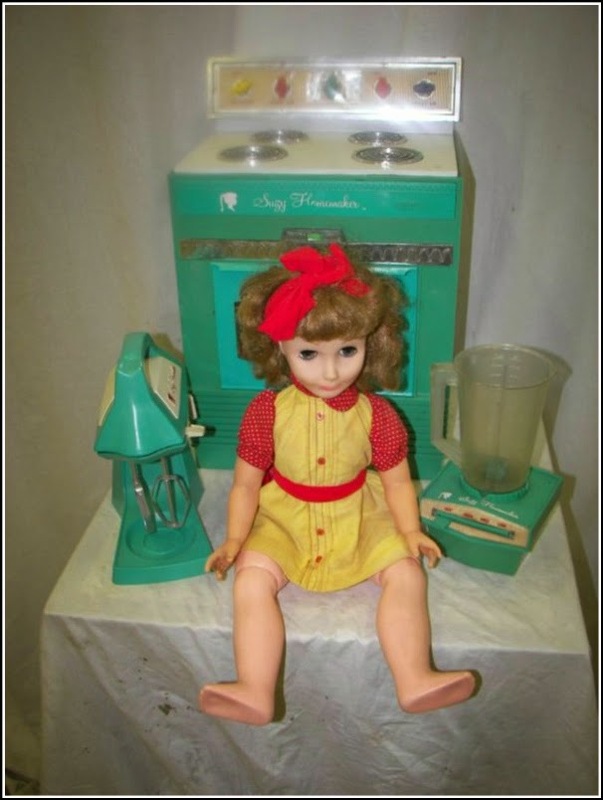 It is totally frightening and I bet every little girl who owned one had nightmares!! LOL Hugs!! I always wanted a Suzy bake oven when I was a child, but my mom was too worried (paranoid?) about a fire, yet she taught me and my sister how to cook when we were very young. Such a life irony.